Today’s Mac Gem is a simple one, but it’s sure to be useful to developers, frequent users of Boot Camp, and anyone else who regularly boots their Mac from different startup volumes. A few years back, I covered BootChamp, a utility that lets you restart an Intel Mac into Boot Camp without having to open System Preferences and permanently change your startup disk, or without having to restart and hold down the Option key, waiting for OS X’s Startup Manager to appear. 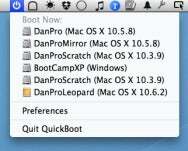 If you frequently switch between booting into Mac OS X and Windows, or between different OS X startup volumes, an even better alternative is QuickBoot. QuickBoot provides a systemwide menu listing all bootable volumes along with the OS each contains. (In the case of Mac OS X, the menu lists the specific version number; there’s an option to also display build numbers. In the case of Windows, however, applicable menu items simply read Windows). Choose a volume from the menu, enter an admin-level username and password when prompted, and your Mac restarts using the chosen volume as the startup disk. If you don’t want to waste precious menu-bar space on QuickBoot, it can also function as a standard program, appearing in the Dock and providing a standard Mac OS X window listing all bootable volumes. One advantage to this approach is that you can choose to reboot using the chosen volume either immediately or later (the next time you restart). I did notice a couple minor issues with QuickBoot. First, if you change the name of a bootable volume, or eject a volume, you must relaunch QuickBoot for its list to reflect the change. The other is that neither QuickBoot’s menu nor its window indicate which volume is the current startup volume—an important bit of info if you frequently switch between multiple startup volumes. I’ve also seen reports that QuickBoot doesn’t maintain the default boot volume when used on PowerPC Macs; this feature apparently works only on Intel Macs.